Many small businesses that don’t take online marketing seriously are unaware that their reputation online may not match their local reputation. It is possible that a disgruntled customer, former employee, or even a competitor is putting up bad reviews about you. When 97% of consumers use online search when researching products or services it pays to know what people are saying about you online. It is just plain crazy to think just because your business does so well locally that no reputation management needs to be done online. It is erroneous to think that your customers are so loyal that they will disregard bad reviews. Small business owners need to pay even more attention to Online Reputation Management (ORM) – If you don’t take control of your online reputation, someone else will! 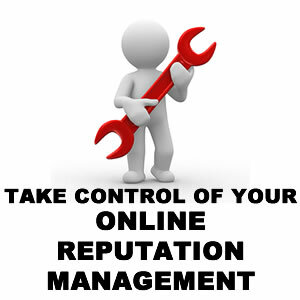 Start Your Online Reputation Management Today! Start assessing your online reputation by performing searches on the major search engines: Google, Yahoo, and Bing. Don’t just search for your business name but also search for your products, your highest-profile employees, your own name, and any usernames or handles you use on any other site. Always address customers’ comments, and complaints. Be proactive about customer feedback and even more so about customer service. When customers reach out on social media it is usually because emails and phone calls have been ignored. When phone calls and emails go unanswered, customers feel as though they have no other option but to make themselves be heard. Have a customer service policy in place to respond to phone calls and email in a timely manner. Monitor social media sites for conversations about you and your business and be prepared to join the conversation. If a complaint or bad review is legit, take the time to acknowledge and offer solutions. A mistake some companies make is to fight back but that only escalates the issue and makes you look worse. Remember to offer positive feedback. Sometimes it may be impossible to remove a false review or complaint. You can fight bad reviews by soliciting and posting good reviews. Get your satisfied customers online to spread the word about your great products and services. It’s time to take your online marketing seriously and take control of your online reputation by monitoring, responding and getting positive feedback.